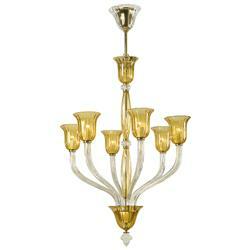 Golden rays of light shower down on any room when this beautiful chandelier is turned on. Clear and amber glass are combined to create a warm aura. While undeniably traditional, this piece has a modern aspect which would work beautifully in a Hollywood Regency dining room.